Design professionals Ristrutturami have designed a gorgeous little home for us to explore today. 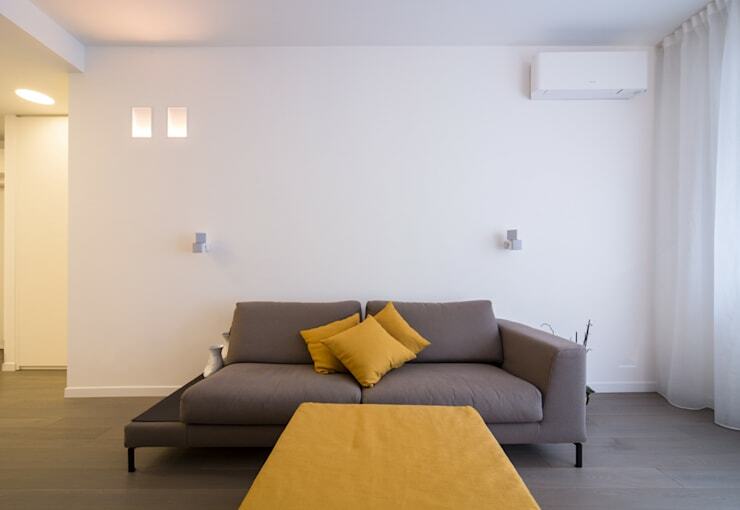 These designers are professionals when it comes to finding solutions that are ideal for small spaces, ensuring that a home is functional and budget-friendly. 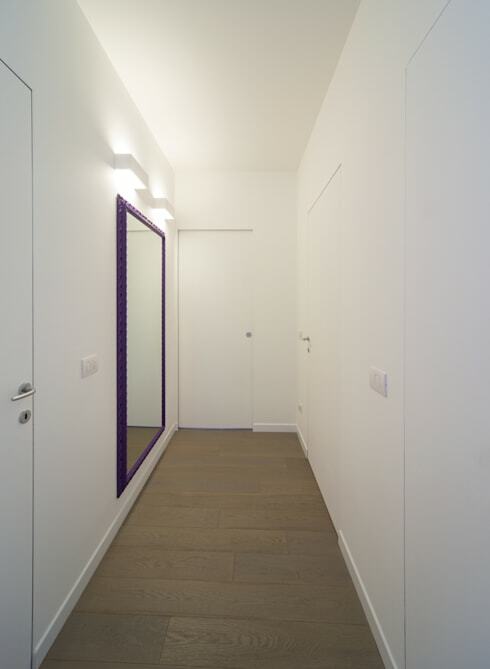 This project is a wonderful example of a small little traditional home that is only 80 square metres in size. Yet the designers have managed to create a stylish, trendy and comfortable space without breaking the bank. This is an example all South Africans could learn from! 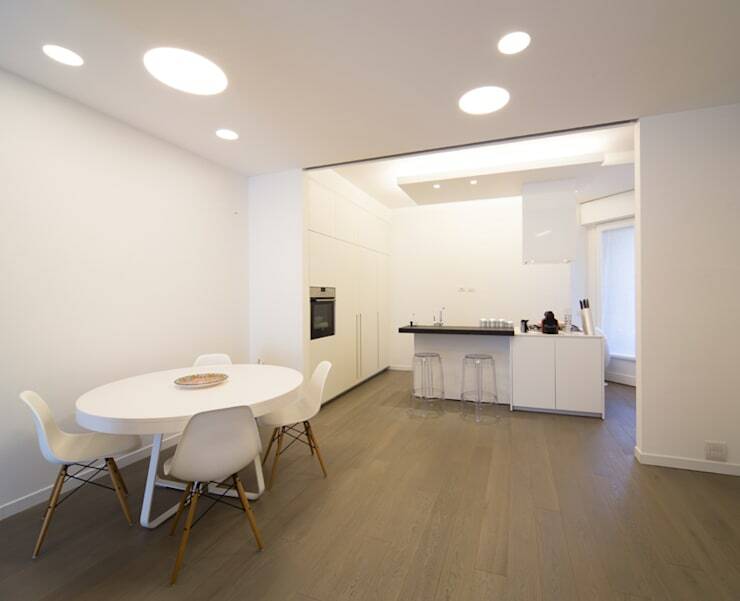 In this angle, we can see how natural light works with the white walls, creating a very bright and inviting space. The large doors and windows that run across the one side of the room play a big role in this, allowing the sunshine to filter into the home. Another option would be to install skylights in the ceiling. As we explore the home, we will find that throughout it, the designers have chosen white as the dominant colour in the house. White is very distinctive and is suitable for small spaces. In the living room, we can see how the white walls create a very light space, increasing the visual feel of the area. 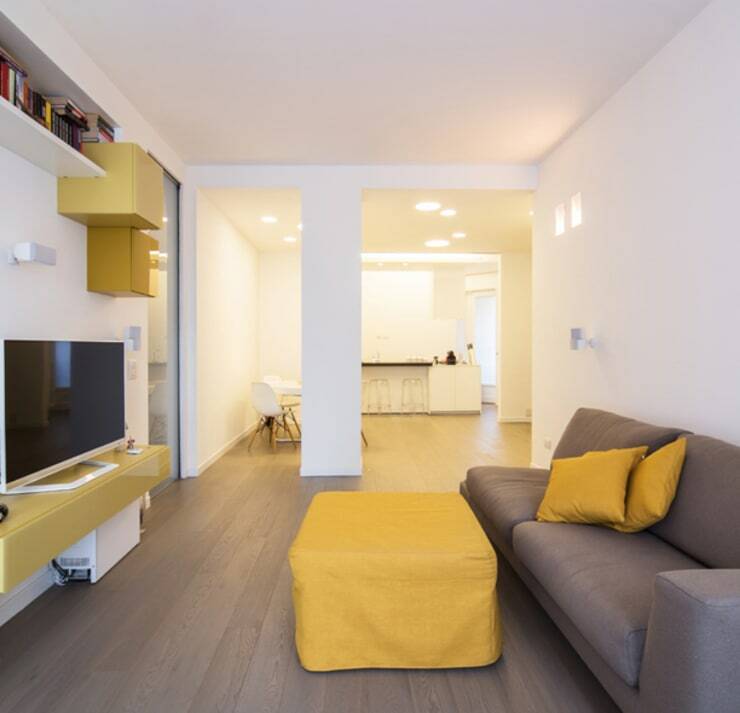 They have also introduced yellow to the area in the form of cushions, a coffee table and the shelves on the wall, which introduces touches of vitality while working in harmony with the white tones. When you have a small space, you want to introduce the most functional of items to it. A simple wall television like this one is sleek and savvy as well as functional. It also takes up minimal space. You'll also notice that the designers have used the shelves to their advantage, keeping books and other items stored neatly away. 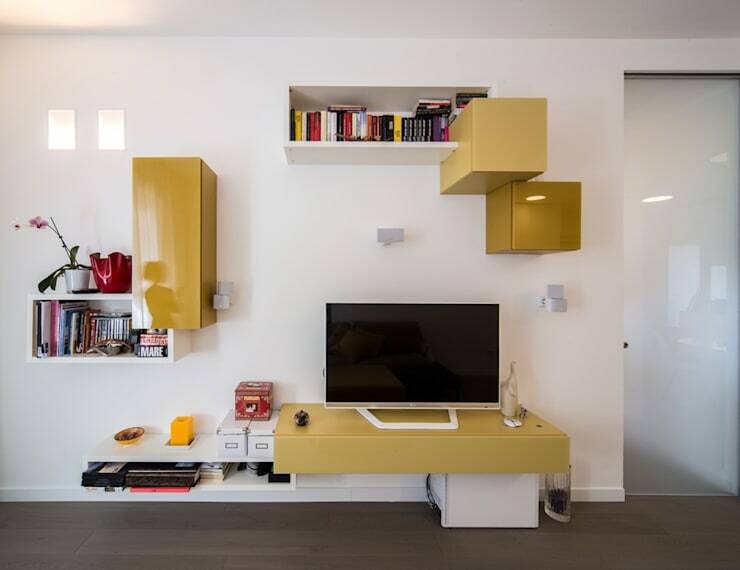 Tip: Make the most of vertical space in a small home! The decor is simple but comfortable. 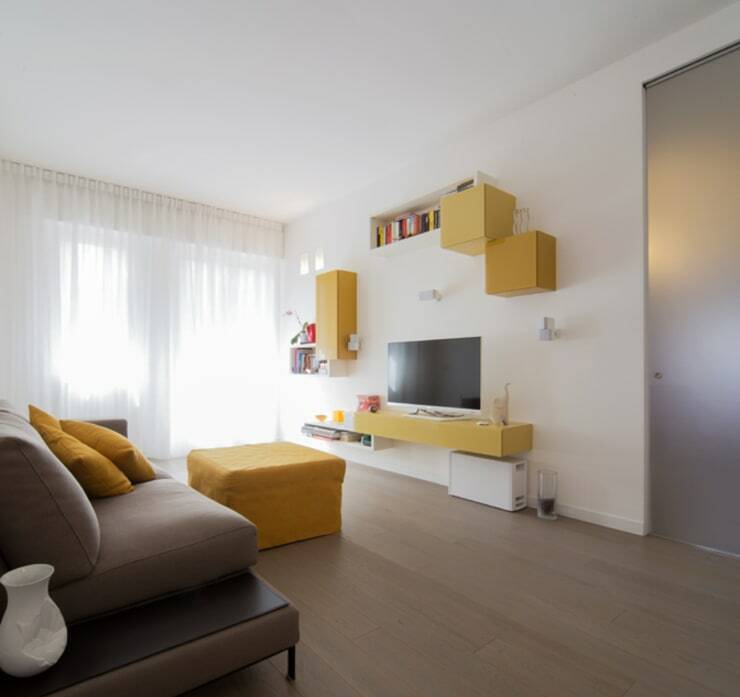 The designers have also ensured that the colour tones used throughout this space work in harmony as we have seen with the yellow shelves, the white television, the grey sofa and the yellow cushions. You don't need to go into too much detail with your furniture and decor, especially in a small home. Opt for simple and functional. 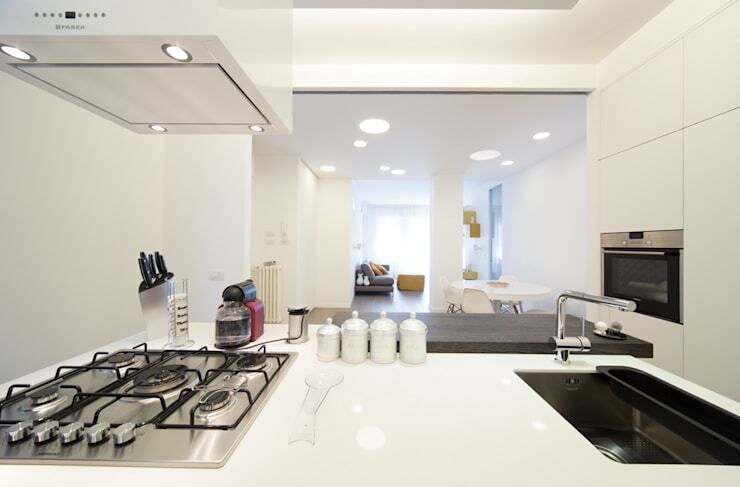 The designers have gone for an open plan design, creating a kitchen that opens up onto a small dining area. This ensures that the living areas see that much bigger and more spacious. The kitchen has also been completed with a stylish breakfast bar, which subtly separates this space from the rest of the home without compromising on the perception of space. It also means that there is a comfortable and cosy spot for the family to come together while the chef cooks up a storm! 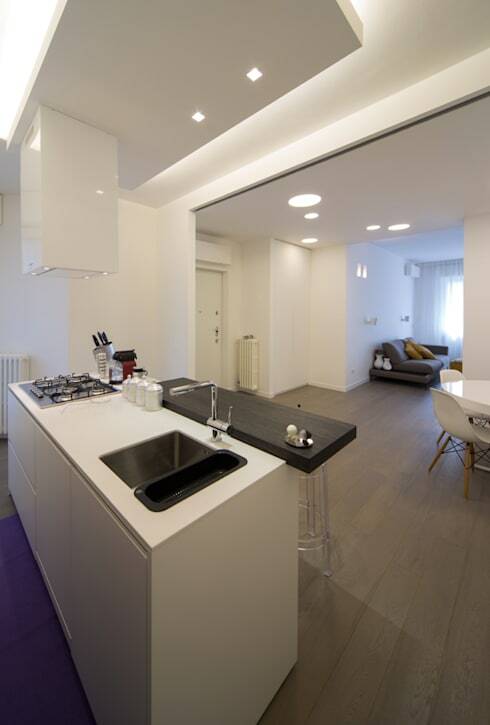 In this image, we can also see what a big role lighting plays in small spaces. By illuminating the area with soft light in the ceiling, a sense of comfort and space is created. Have a look at these dazzling lighting ideas for modern houses for inspiration. In this image, we can see how the kitchen truly features everything that you could possibly need, despite the limited space. By paying attention to detail, the designers have created a sense of elegance in this space. Don't be afraid to invest in the latest appliances, sprucing your kitchen up with modern technology. The home owners may wish to change the look and feel of this space in the future so the design of the roof can be exploited. 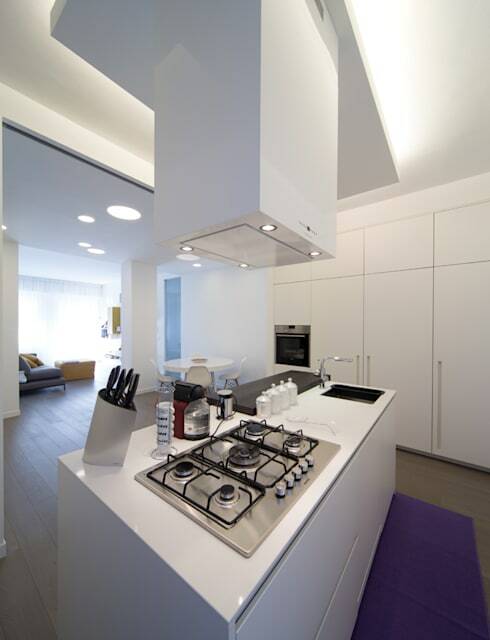 In this image, we can see a clear distinction in the roof where the kitchen is connected to the rest of the house. A wall could be installed here at some stage, for example. 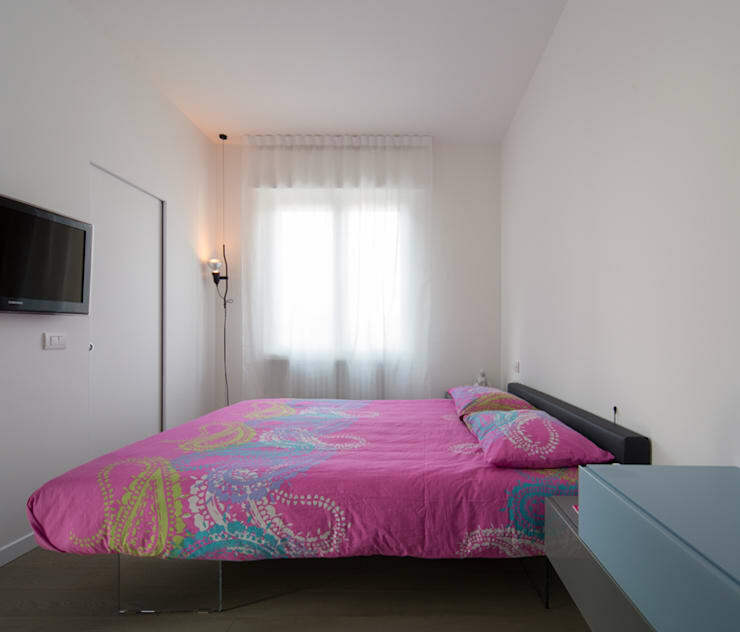 The bedroom features extreme simplicity with minimal details, along with a small bathroom. This minimalist design isn't very expensive, but looks incredibly savvy. 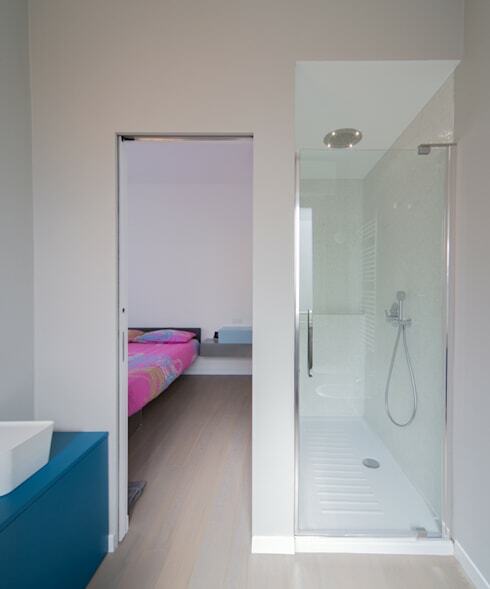 If you don't have much space, opt for a small cabin shower like this one. It's still very stylish and modern yet space-savvy. 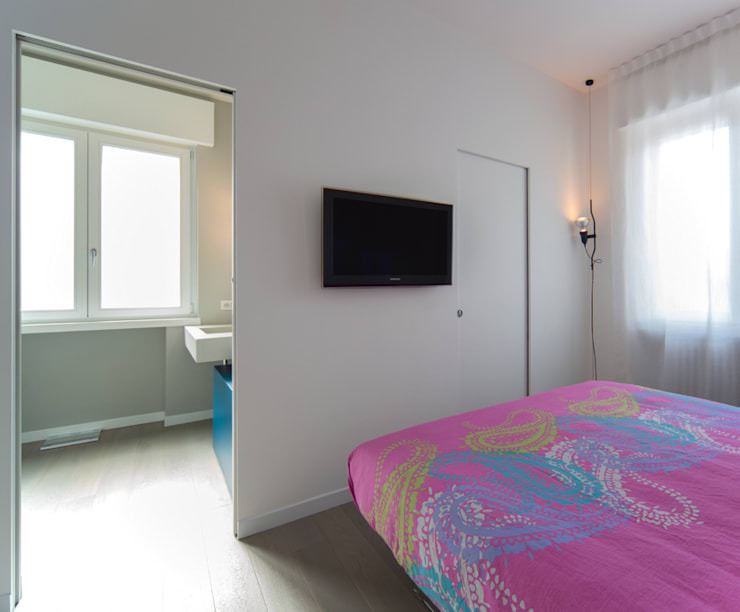 Install a television on the wall in the bedroom so that you don't take up any space, but you still create a little entertainment hub! 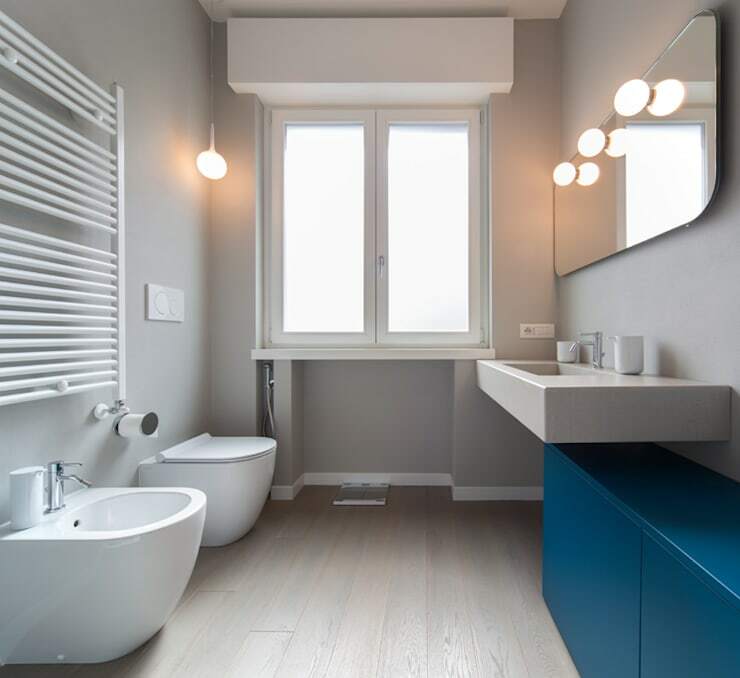 The bathroom is modern and stylish, but has been created on a budget. With the right features, you can achieve the same look and feel in your bathroom without having to spend too much money. 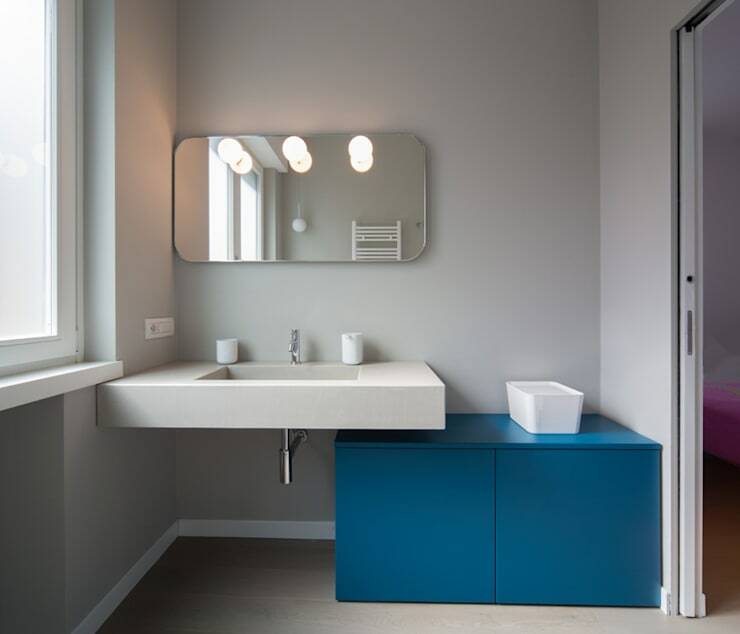 Don't you love how the designers have introduced some blue tones to the bathroom in the form of this cabinet, while maintaining a sleek and minimalist look and feel? Your corridor needs a bit of decor and design too! 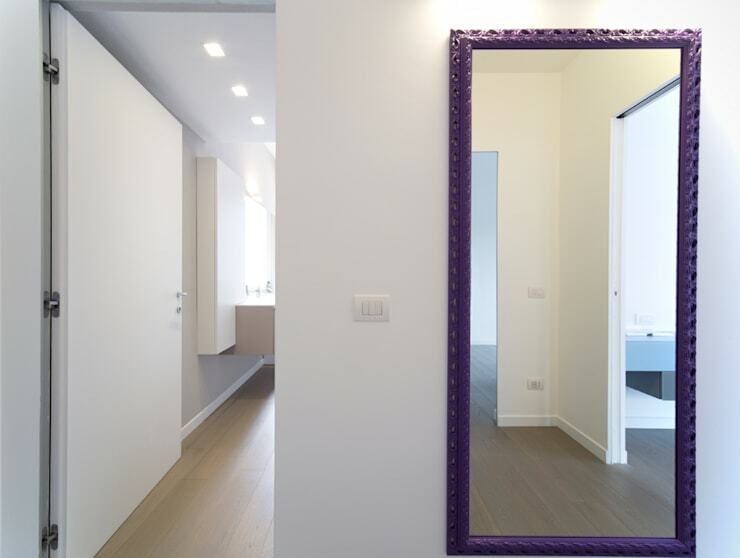 As we close this ideabook, we want to remind you how mirrors can play such a big role in a small space. They truly add depth to an area, while creating the impression of space. If you've enjoyed exploring this little home, you'll enjoy this: Before and after: giving a tiny home a big new personality.